Also referred to as Souk Al Kabir, Meena Bazaar is a shopping district in Dubai. 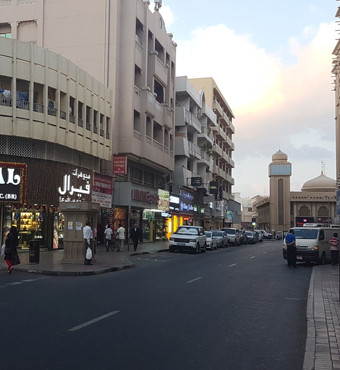 Meena Bazaar is located in the area of Bur Dubai and is one of the oldest residential areas in the city with hundreds of textile, jewellery and clothing shops, as well as eateries. 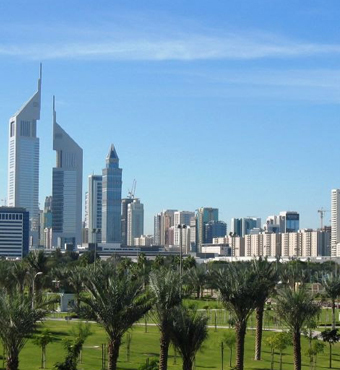 The locality also encompasses the historic Al Bastakiya district of Dubai. 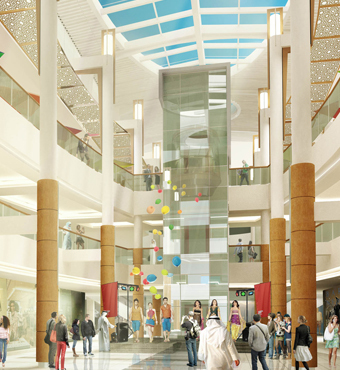 Burjuman is one of the oldest shopping mall in Dubai, located in the residential area of Bur Dubai. The distinctive landmark comprises over 2.8 million square feet of mixed-use space including the shopping mall, business tower, hotel suites and duplex residences. The mall comprises over 800,000 square feet. 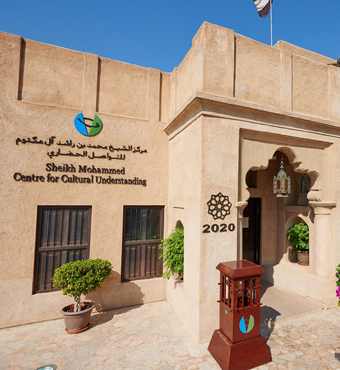 Anyone keen on delving deeper into Emirati culture and history should take advantage of the activities and tours offered through the nonprofit Sheikh Mohammed Centre for Cultural Understanding. 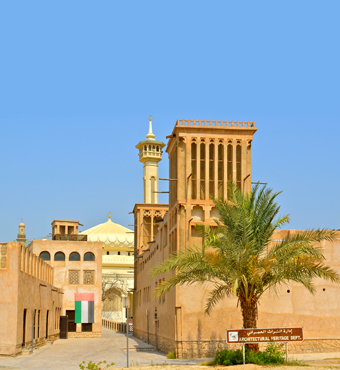 Guided by the motto 'Open Doors, Open Minds', this unique institution was founded in 1995 by Dubai's current ruler, Sheikh Mohammed bin Rashid Al Maktoum, in order to build bridge between cultures and to help visitors and expats understand the traditions as well as customs of the United Arab Emirates (UAE). Escape the skyscrapers of the city centre and travel back in time with a trip to Al Fahidi Historical Neighborhood, also known as Bastakiya. This atmospheric area in Bur Dubai is one of the oldest heritage sites in the city, with a neighborhood that dates back to the early 1900s. A tour of the area offers a beguiling glimpse into the Dubai of a bygone era including traditional wind towers, bustling courtyards and maze of winding alleyways. Today, there are about 50 buildings containing museums, craft shops, cultural exhibits, courtyard cafes and art galleries. 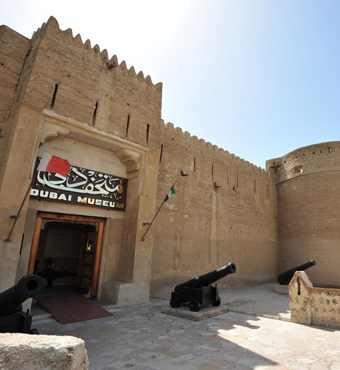 Dubai's best museum occupies the sturdy Al Fahidi Fort, built around 1800 and considered the city's oldest structure. The exhibit charts the emirate's turbo-evolution from fishing and pearling village to global centre of commerce, finance and tourism in an engaging, multimedia fashion. A walk-through of the souk exhibits on Bedouin life in the desert and a room highlighting the importance of the sea illustrate the days before the discovery of oil. The last room showcases archaeological findings from nearby excavation sites. This sprawling park is hugely popular with families and filled with activity zones, including a pretty lake with cascades and a restaurant as well as interactive themed areas such as a Technology Zone, a Barcode Garden, an Alternative Energy Zone and a Space Maze. Views are great from the 45m-high Panoramic Tower. The park hosts a farmers' market every Friday and a flea market on the first Saturday of the month (October to May). The Dubai World Trade Centre (DWTC) is a business complex in Dubai, United Arab Emirates, built by Sheikh Rashid bin Saeed Al Maktoum. 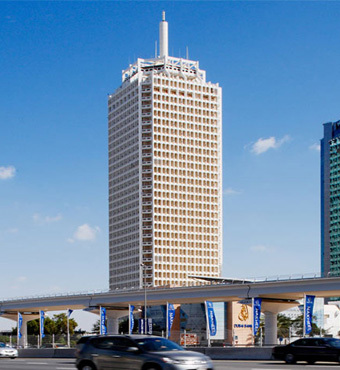 It is located along Sheikh Zayed Road at the Trade Centre Roundabout. The complex comprises the original tower (built in 1978), eight exhibition halls, the Dubai International Convention Centre and residential apartments. Dubai Gold Souk is a traditional market. The souk is located in Dubai's commercial business district in Deira, in the locality of Al Dhagaya. The souk consists of over 300 retailers, most of whom are jewellery traders. According to estimates, approximately 10 tons of gold is present at any given time in the souk. It is bordered to the north by the Dubai Fish and Vegetable Market and the Deira Corniche near Baniyas Square at Sikkat al-Khali Street which is in close proximity to the Deira Bus Stand. 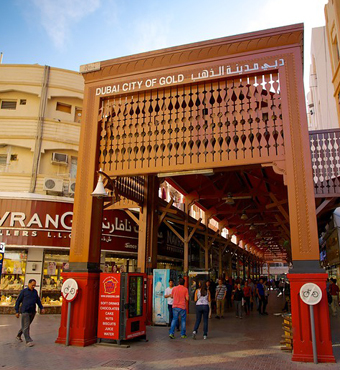 The Dubai Gold Souk is 5 minutes’ walk from the Old Souk marine station. Known as Burj Dubai prior to its inauguration, is a skyscraper in Dubai, United Arab Emirates. 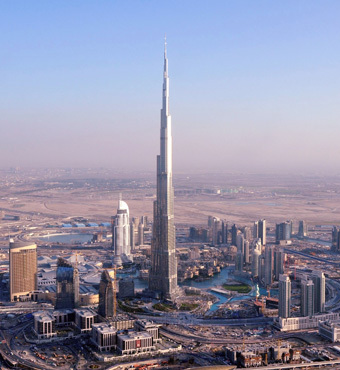 It is the tallest man-made structure in the world, standing at 829.8 m (2,722 ft). Construction began on 21 September 2004, with the exterior of the structure completed on 1 October 2009. The building officially opened on 4 January 2010, and is part of the new 2 km2 (490-acre) development called Downtown Dubai at the ‘First Interchange’ along Sheikh Zayed Road, near Dubai’s main business district. Burj Khalifa was designed to be the centerpiece of a large-scale, mixed-use development that would include 30,000 homes, nine hotels (including The Address Downtown Dubai), 3 hectares (7.4 acres) of parkland, at least 19 residential towers, the Dubai Mall, and the 12-hectare (30-acre) man-made Burj Khalifa Lake. Distance from the Al Khoory Inn Bur Dubai : 8.9 KM – 20 Mins. Dubai International Financial Centre (DIFC) is a 110-hectare district and major global financial hub for the Middle East, Africa and South Asia (MEASA) markets. 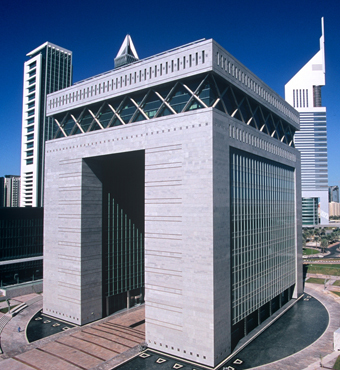 DIFC has its own independent, internationally regulated regulator and judicial system, common law framework, global financial exchange, tax-friendly regime, and a large, cosmopolitan business community. The district houses hundreds of financial institutions, including wealth funds and private investors, although it also hosts multinationals, retail outlets, cafés, restaurants, residential space, public green spaces, hotels and art galleries. 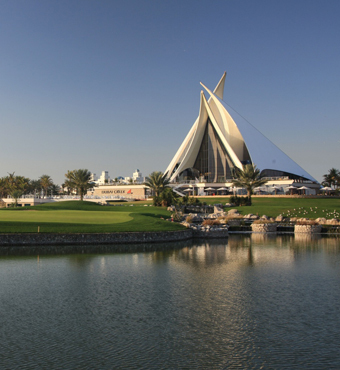 Dubai Creek Golf & Yacht Club first opened in Dubai, UAE, in 1993, comprising an 18-hole par 71 championship golf course with a distinctively sail-shaped clubhouse. It was home to the first golf academy in the Middle East. The clubhouse comprises a number of function rooms as well as changing facilities and the 'Legends' fine dining restaurant. It is situated in the heart of the city, on the Deira side of Dubai Creek. The yacht club is based in a separate building and is home to the popular outdoor restaurants and venues, Boardwalk and QD's. To the Creekside of the yacht club is a marina. 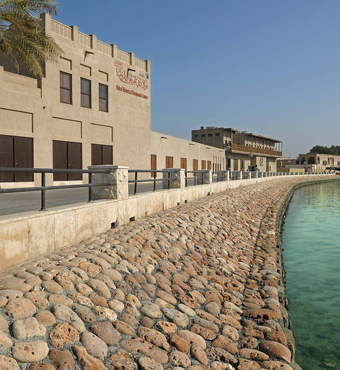 The Dubai Creek Golf & Yacht Club is also home to the city's only seaplane tour operator, Seawings. The Dubai Mall is the world’s largest shopping mall based on total area and fourteenth largest by gross leasable area. It is part of the 20-billion-dollar Downtown Dubai complex, includes 1,200 shops and is considered as a shopper’s paradise. Access to the mall is provided via Doha Street, rebuilt as a double-decker road in April 2009. 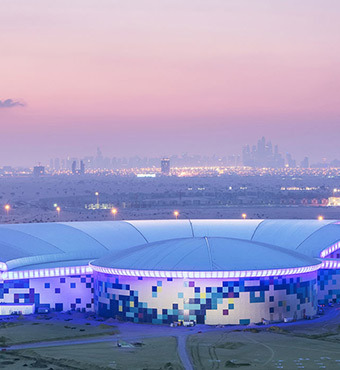 The mall also hosts other notable attractions like Dubai Aquarium and Underwater Zoo, SEGA Republic indoor theme park, Vox Cinemas and Rainforest Café to name a few. Dubai mall is also well connected to Dubai Metro. Distance from the Al Khoory Inn Bur Dubai : 10.9 KMs – 24 Mins. Jumeirah Beach is a white sand beach that is located and named after the Jumeirah district of Dubai. It stretches along the coast south of the city’s historic district to the junction with The Palm Jumeirah and terminates between the southern end of the Jumeirah Beach Residence (adjacent to the Dubai Marina district) and the port facilities at Jebel Ali. The adjacent districts to the beach include Jumeirah (1, 2, & 3); Umm Suqeim (1, 2, & 3); and Al Sufouh, though colloquially, this entire string of neighborhoods and districts from the southern edge of Karama to the terminus of the Palm Jumeirah at Knowledge Village is sometimes referred to as the “Jumeirah Beach Road” area. 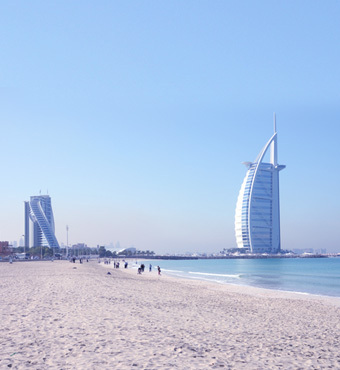 The beach and its frontage feature large hotels, resorts, and housing developments, including the Burj Al Arab (Arab Tower) hotel, Wild Wadi Water Park, Jumeirah Beach Hotel, and the old-style Madinat Jumeirah, a hotel and shopping complex. The Wild Wadi Water Park is an outdoor water park in Dubai. Situated in the area of Jumeirah, next to the Burj Al Arab and the Jumeirah Beach Hotel, the water park is operated by Jumeirah International. 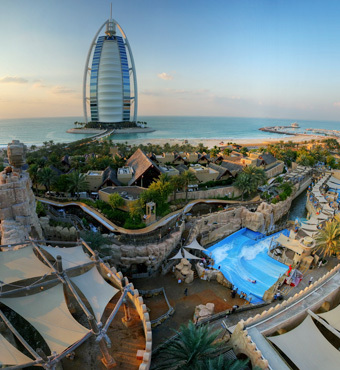 Wild Wadi has a heated/cooled wave pool, multiple water slides and two artificial surfing machines. In addition, the park had the largest water slide outside of North America, but recently it was removed to make space for two other rides. Another feature of the park is an 18 m (59 ft) waterfall that goes off every ten minutes. It was featured in The Amazing Race 5 and The Amazing Race Asia 1, in which teams had to slide down a 21 m (69 ft) drop. It was later featured in The Amazing Race Australia 2, but instead, the teams had to ride the Surf Machine and use boogie boards to surf their way to the end where they will get their next clue. The Palm Jumeirah is an artificial archipelago created using land reclamation by Nakheel, a company owned by the Dubai government in United Arab Emirates. It is one of the three planned islands called the Palm Islands (Palm Jumeirah, Palm Jebel Ali and Palm Deira) which would have extended into the Arabian Gulf, increasing Dubai’s shoreline by a total of 520 kilometres (320 mi). 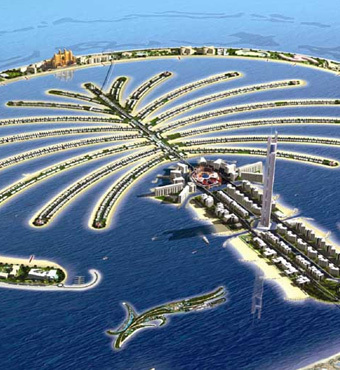 The Palm Jumeirah is the smallest and the original of three Palm Islands. It is located on the Jumeirah coastal area. 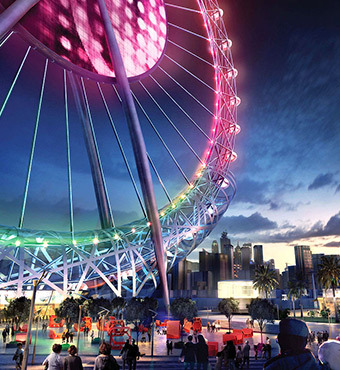 IMG Worlds of Adventure is Dubai’s first mega themed entertainment destination promising visitors from around the world the excitement of four epic adventure zones in one location. Two of the four zones represent renowned global brands Cartoon Network and MARVEL, while IMG Boulevard and the Lost Valley – Dinosaur Adventure zones are original concepts created by the IMG Group. Now open, IMG Worlds of Adventure will be the largest temperature controlled indoor themed entertainment destination in the world, covering an area in excess of 1.5 million square feet. With the capacity to welcome more than 20,000 guests a day, the destination will feature a unique array of adrenaline-pumping roller coasters, thrill rides, and spine-tingling attractions based on popular Cartoon Network characters, iconic MARVEL Super Heroes and hair-raising dinosaurs. 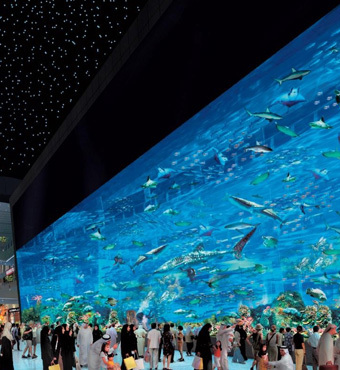 Additionally, the destination will be home to a number of world-firsts, a variety of themed retail stores, exclusive dining venues, and a 12-screen state-of-the-art cinema. Global Village is Dubai’s leading family entertainment and cultural attraction with a unique shopping experience at 32 pavilions each representing a different country. Global Village also offers a variety of dining options from different cuisines, along with thrill rides and children rides at the Fantasy Island. 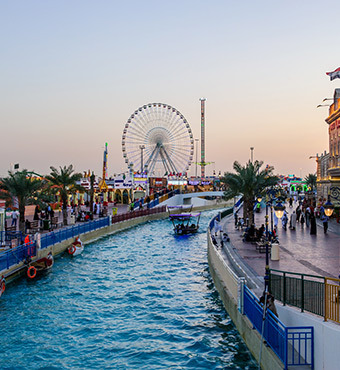 Launched in 1997, Global Village was first based on the Creek side then Oud Metha then Dubai Festival City, until it found a permanent home in 2005 on Sheikh Mohammad Bin Zayed Road Exit 37. Every year, it has over 5 million visitors from across the globe. More than 45 million blooming flowers in stunning designs, awesome shapes and structures, and eye catching color combination is achieved through 45 different flower varieties and color. 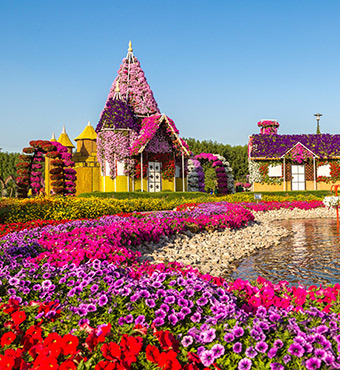 Miracle Garden is one of a kind in the region and in the world for such a unique display and extravagant outdoor recreational destination. Miracle Garden has the record in Guinness Book of Records for having the longest flower wall which will give new landmark for the destination and City of Dubai, believed to be leader in diverse and cultural tourist attraction. Dubai Parks and Resorts is the region’s largest integrated theme park destination comprising three theme parks: Motiongate Dubai, a movie inspired theme park showcasing some of Hollywood’s most beloved characters from DreamWorks Animation, Sony Pictures Studios and Lionsgate; Bollywood Parks™ Dubai, the first theme park based on the sights and sounds of Bollywood; as well as LEGOLAND Dubai, a unique, interactive theme park for families which will bring the well-known LEGO brick to life in a playful learning environment; and LEGOLAND Water Park, the region’s first water park catering to families with children aged 2-12.